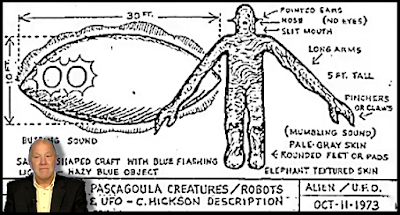 ON October 11 1973 Calvin Parker, then 19, was fishing with his mate Charlie on the Pascagoula River, Mississippi, when he was abducted by aliens. Over four decades later and Calvin – who has written a book about his spooky experience – was ready to tell his story to This Morning presenters Lisa Snowdon and Nigel Havers. The This Morning duo were filling in for Ruth Langsford and Eamonn Holmes. “We were going fishing and we’d got off work at the shipyard and while we were fishing we saw some blue, hazy lights from behind us,” Calvin explained. “It was just really bright lights coming out and that’s when three aliens or beings of some kind come out of the craft, two of them got hold of Charlie and myself. « Russian Space Weapon Now in Orbit?